A team of researchers working at the Chinese Academy of Sciences has developed an electronic skin that is sensitive enough to detect changes in air moving, falling drops and moving ants. In their paper published in the journal Science Robotics, the group describes their e-skin and possible applications. As scientists continue to improve the look and capabilities of robots, one of the prime areas of research is skin. Robotics engineers would like to develop an e-skin that is similar to human skin. This is because it is believed that future robots will need the ability to "feel" things in order to perform sophisticated, yet subtle activities. Such activities might include responding to temperature, noticing changes in texture, or processing pleasurable sensations. In this new effort, the researchers in China have made advances in sensitivity of an electronic skin. The new skin is able to detect very small changes in pressure and convert what it finds to pulses. It was made by covering a magnetic sensor with a hollow polymer membrane and then embedding magnetic beads in the top part of the membrane. As pressure is applied, the membrane is pushed in, which allows the embedded magnetic beads to move closer to the sensor. The resistance created is sent to an electronic circuit. The electronic circuit then converts the signals to a series of pulses of varying frequencies that reflect the amount of pressure being "felt" on the skin. 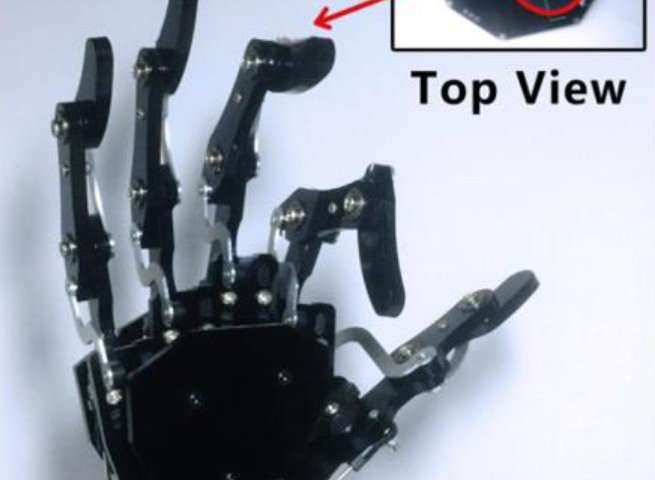 The researchers created an artificial finger covered with the e-skin and then attached the finger to an artificial arm for testing purposes. They report that the skin they created was able to generate pulses for pressure as small as that created by a line of ants running over the surface. It was also able to detect changes in wind speed and differences in the size of water drops that impacted on its surface. The researchers report that their e-skin was able to detect pressure changes better than human skin, in some cases. They believe their new e-skin could prove useful in robotics and as a means to improve the performance of artificial limbs.